The legal recognition of the right to health worldwide has never been so advanced. At least 115 constitutions around the world have entrenched the right to health or health care, whether as justiciable claim-rights, aspirational guarantees, or a combination of the two. As of November 2012, every country except South Sudan is a party to at least one human rights treaty that addresses the right to health or other health-related rights. Often, international obligations lead to policy recommendations and supervisory measures within the international legal domain, which can affect domestic law and health policy. Yet increased levels of mobilization and litigation have also occurred at the national level with respect to the right to health provisions entrenched locally. For advocates of the right to health, the path is open to create health systems that are more rights respecting and more just. Yet deep uncertainty about the legal operation of the right to health remains. Opponents argue that its entrenchment leads to an expansion of judicial power — as well as the introduction of incommensurable individual and curative claims — in a necessarily utilitarian policy area. We suggest two questions to unlock this debate. First, what are the effects of justiciability on a healthcare system? Second, how do matters of institutional design change those effects? 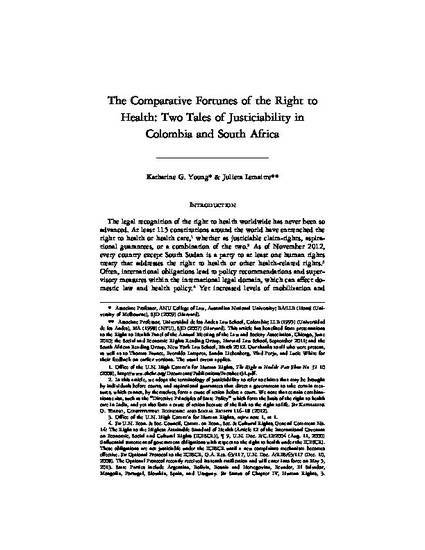 In this Article, we examine these questions by comparing the operation of the right to health in the domestic legal systems of Colombia and South Africa.